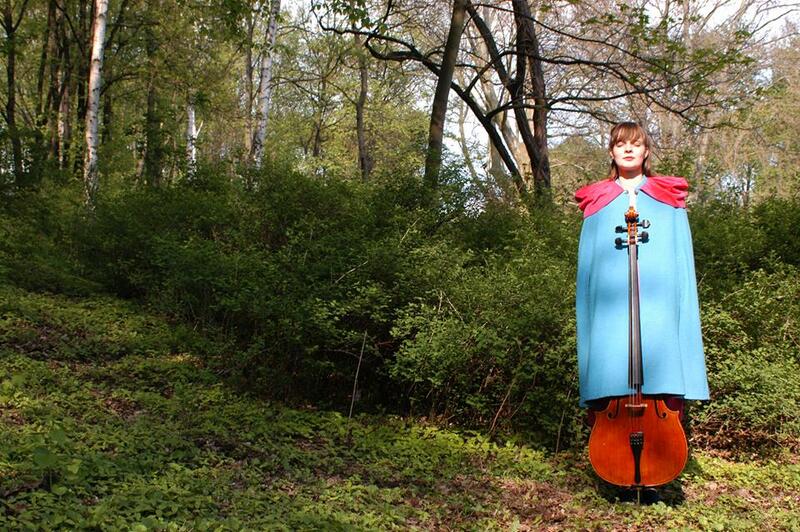 Hildur Guðnadóttir (1982) is an Icelandic cello player, composer and singer who has been manifesting herself at the forefront of experimental pop and contemporary music (e.g. with the band múm). Gudnadóttir began playing cello as a child, entered the Reykjavík Music Academy and then moved on to musical studies/composition and new media at the Iceland Academy of the Arts and Universitat der Kunste in Berlin. Hildur has released four critically acclaimed solo albums: Mount A (2006), Without Sinking (2009), Leyfðu Ljósinu (2012) and Saman (2014). Hildur was nominated as composer of the year and Without Sinking got nominated as album of the year at the Icelandic Music Awards in 2009. She has been nominated for SHAPE by ASSOCIATION ELEKTRONI[K]. This interview took place in her Kreuzberg studio on a sunny January afternoon, surrounded by bespoke instruments that she is working with. Hildur Guðnadóttir: One of the instruments that you see there is a feedback cello, it has pickups for every string and a speaker on the back and a feedback mechanism. Has it been custom-built for you? HG: Yes, an Icelandic friend Halldor Ulfarsson, who is a designer, built it. He started to develop this guitar instrument and wanted to expand it to a classical one. We are old friends and he knew I was into experimenting, so he chose the cello as an interface, the body for it, so it was built with my in mind. I’ve been helping him develop it, coming up with practical solutions like how to hold it, etc. We’ve been working on this for about eight years. Another friend of mine, Hans Jóhannsson, coming from the classical music background, told me about this idea for a cello that’s modular and you can take it apart. The body can be attached to the instrument and also taken apart and so it becomes a surround instrument. About two and a half years ago, when I was pregnant, I called him and said “I don’t think I can travel with a child and a cello on a plane.” I told him about some other specific features I wanted the instrument to have and he went ahead and designed it. So my friend Ómar came to life. It’s an incredibly fun process of throwing ideas back and forth. I designed the straps so I can attach it to me, and I’m free to move around, which brings a completely different energy to my shows because now I have more flexibility. I can also attach these resonating chambers to the instrument or divide them in space. It also has a filter that’s been built into a chip. I can put whatever samples I want into the filters, for instance, I would take a sample of my cello and mix it together with what I’m playing on the instrument. What relationships do you have with the various sonic media? Because you seem to be quite open to experimentation. HG: I come from a classical background but I was pretty young when I started to play with bands and make experimental music. It didn’t happen straight away that I brought the cello into the experimental side of making music. There’s a lot to be said and done with classical media like the voice and the cello. Electronic music is nice, but I’m personally more interested in the acoustics, the physical resonance and the physicality of sound and its spatialisation. When you grow up playing an instrument like a cello, you have this big resonating chamber that lies on your body, you feel the resonance in the wood, and the same goes for your voice. When you sing, your whole body resonates and you basically become a resonating chamber for the sound that you’re producing. My main interest in working with sound is how the physicality is produced and how to work with that. I’m very technologically-oriented, I do a lot of programming. I love technology, but I also love physics and material. We are living in really exciting times now because we have all this technology – you can have super complex things like this filter, these incredibly complex algorithms in a tiny format. Few years ago you needed a huge computer for that. This allows us to expand what we are doing since our gear is both getting smaller (i.e. transportable) and more powerful. Do you think it’s harder because of all the means of technology at hand and the whole technologisation of the world to convey emotions through technology? HG: Technology is just a tool, like a cello. You can definitely convey a lot of emotions through a computer or an electronic instrument. We see a lot of laptop musicians nowadays and I think people sometimes feel a lack of emotions when the person is “only” playing a computer. People also know the computer as something that we use for practical matters, like emailing, banking, etc, it’s such a multifunctional tool, and I think that can sometimes get in the way for the audience seeing “only” a computer on stage. The cello is much more limited. You sometimes hear after laptop shows that “the musician was just checking his emails”. No emails on the cello, not yet, at least. (laughs). For me it’s not very satisfying to only make music on a computer. I have done that, I have spent time only programming. There was a year when I completely stopped playing the cello. I would spend a week writing a code and afterwards I would maybe get a beep. I have a hard time expressing myself though those means, but I admire people who can. After this year of just writing the code, I took the cello, and was like “Instant sound”! On the last record, you used the voice. What importance has the voice in your work, would you like to explore it more? HG: I used to sing in choirs in my home town since I was very young. I was dressed as a viking, bringing groups of tourists into a cave singing Icelandic folk songs. I have a pretty long history of performing as a vocalist. For instance with múm I mostly sing. It took me a while to bring it into what I was doing personally. You are revealing yourself as you go along because the cello is very personal for me, it’s connected to a big part of my history, and the voice even more so, it is me. I’m increasingly bringing it into my work, and getting to know myself. What I find fascinating, coming back to resonance, is that both the cello and the voice are very connected. When you sing, your chest resonates, and the cello lies on your chest as well. These resonating chambers, the chest and the cello, are connected and that’s why I’ve been experimenting with that quite a lot in the last years to melt those resonances together. The frequency ranges of both instruments are very similar. You can mix them together. I have been actually signing on all my records but it’s really hidden. Everyone in Iceland seems to be a musician. Is this perhaps connected to the nature, the genius loci? How was it for you to grow up there, were you surrounded by a musical culture? HG: The nature in Iceland is very present, of course. It’s a tiny island and you’re next to the ocean, there are mountains everywhere. But I’m not trying to reproduce that in my work. Both of my parents were musicians so I grew up in a very musical environment. For me making and playing music is the most natural thing in the world. There are strangely a lot of musicians coming from such a small place. We were living on a small island and there wasn’t much to do. In the end, you put all of these bands together, play shows, basically just to have fun with your friends. The reason for making music is to communicate, both with the people you’re playing with and the audience. One of the biggest privileges of making music is that you make these connections that can go beyond words. With my friends Jóhann Jóhannsson and múm, we are probably going to end up in an old people’s home with Alzheimer’s, unable to speak but we’d have this other way of communicating. There’s all this research done about Alzheimer’s and Parkinson’s diseases that actually what people remember, is music. Among others, you also worked with Throbbing Gristle. How do you recollect this experience? HG: My part was to write music for the choir. They wanted to work with a choir, but they don’t know how to write music, they only improvise when they play live with very little decided in advance. It was really interesting to try to find a way to mediate between people who are so open and flexible and people who are used to being told exactly what to do. I’m used to doing both, writing and reading music from a paper and improvising. So I was kind of on both sides, it was fun to do that but also challenging. What other extra-musical inspirations do you have? HG: My main driving force is the physicality of the sound and resonance. A lot of what I do has to do with experimenting, and another side is writing music for theatre and film. I’m starting to work on a crime series with Jóhann. I love crime novels, I’m a total Sherlock Holmes fan. I’m interested in the medium of series because as opposed to films, you can spend so much time with the characters. Writing music for something where you have so many hours of material is exciting because you simply have more time to develop an atmosphere. I’m also becoming a yoga teacher. I’ve been doing a lot of yoga since I was a teenager and I would like to bring this into music. Eventually I can maybe see myself teaching workshops, where people would work with performing and their body because it’s so connected – people’s postures, how they use their body and breathe can have a huge effect on how they play and perform. That’s been very influential on what I’ve been doing in the last few years.